Hermann's Craig Winkelmann had flames shooting out of his hand in Friday night's semifinal game against Pacific, scoring all of his team's first half 16 points, finishing with a game high 24 points. Owensville, Mo. – In Friday night’s semifinal games, Hermann’s Craig Winkelmann was blazing hot against Pacific, scoring a game high 24 points, draining four 3’s with defenders hanging all over him. Despite Winkelmann’s shooting clinic Pacific was too much, sending Hermann into the third place game, picking up their eighth win, 58-41. In Friday’s second semifinal game between Cuba and Sullivan, it was Sullivan’s forward Seth Mesey who put on the show, scoring a game high 30 points and sending his team past Cuba 77-68. Collin Hart drives down the lane late in the fourth quarter, scoring 11 of his 13 points. Owensville, Mo. 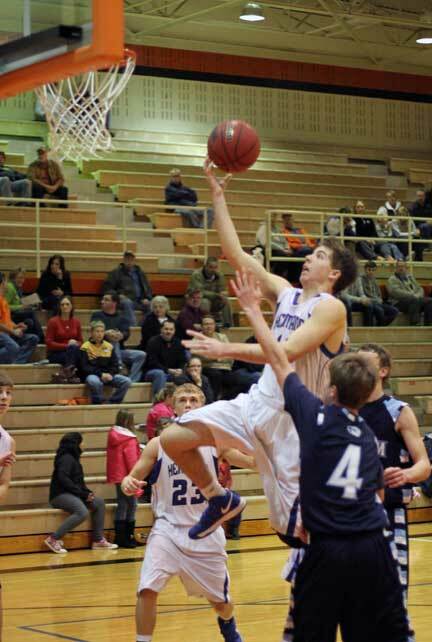 - The Hermann Bearcats kicked off the 24th Annual Owensville Basketball Tournament with a scrappy first round win over the Salem Tigers 53-49 in a very physical game. The two teams shot a combined 53 free throws, committing 45 fouls, and 41 turnovers. Hermann’s Collin Hart was the “X” factor in the fourth quarter, exploding for 11 of his 13 points during the last four minutes of the game. Kyle Ruediger (left) and Cam Edwards (right) collide resulting in both players getting stiches. New Haven, Mo. – Coach Ray Steinhoff said before the season began, “We have to stay healthy,” unfortunately there are some things a coach can’t control. New Haven, Mo. – Coach Ray Steinhoff knew coming into the season they would have a tough time matching up with teams because of their size. So far New Haven has done a good job of doing what they have always been known for, playing tough defense, holding teams to just 41 points per game. 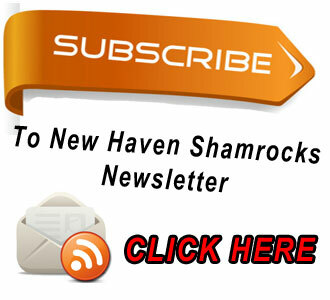 Tuesday night the Shamrocks held the undefeated Tigers (7-0) to a season low 49 points on a team averaging 67 points per game however New Haven committed a season high 21 turnovers in Tuesday night’s loss to St. James 49-41. Pictured Montgomery's Cameron Parrish scored 11 points to help led his team to their third win on the year. New Haven, Mo. – Winter Ball and a Friday night game Montgomery County knew they had their hands full not only playing at New Haven but coming in losing to the Shamrocks two weeks ago in the Montgomery County Tournament. Despite injuries and foul trouble New Haven nearly pulled off another come from behind win but late in the fourth Montgomery County maintained their composer, sneaking away with a four point win, 45-41. Seth Schenck - When you're hot your hot. Schenck lays one in after picking off a steal. 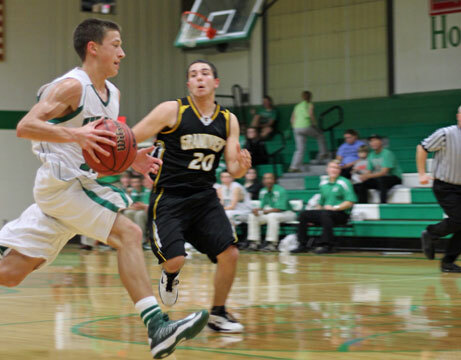 Seth Schenck scored a career high of 21 points, draining a career high of five three-pointers, and tying a career best of six assists in Tuesday’s pounding on Grandview in their home opener with a final of 56-25, improving to 4-1. The Shamrocks led 31-4 at halftime; New Haven’s starting five played very little in the second half, sitting out the entire fourth quarter. Mexico quickly jumped on New Haven taking a 39-12 halftime lead, forcing New Haven into turning the ball over and were unable to get anything done offensively. 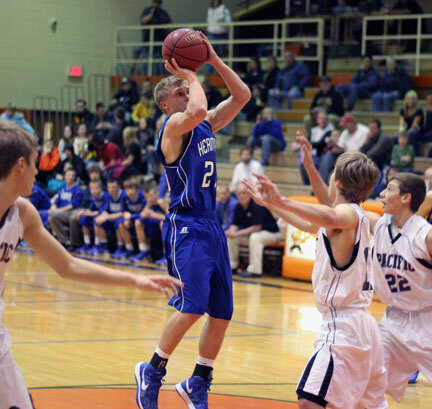 Kyle Ruediger led all scores with 26 points, going four of four from the line. 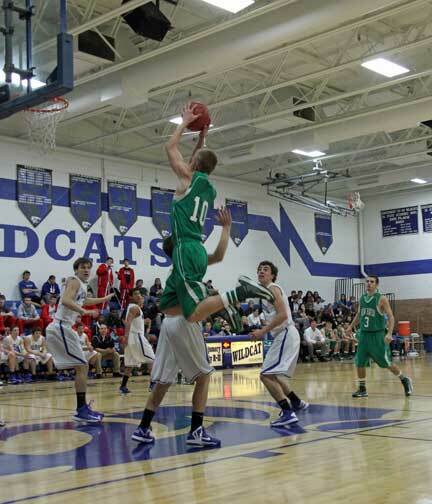 Montgomery County’s Jacob Davis was the only Wildcat to score in double figures with a team high 10 points. 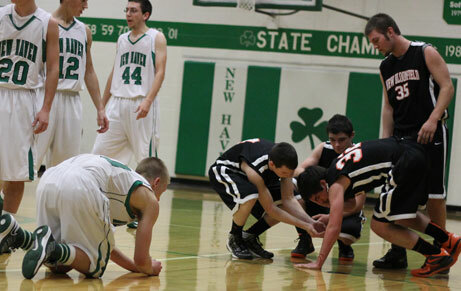 Coach Ray Steinhoff was happy with how New Haven played on both ends of the court. Defensively New Haven forced 17 turnovers, giving up just six offensive rebounds.